Acoustic signals (e.g., speech or music sounds) are decomposed by the biomechanical filters in the cochlea into many narrow-frequency bands. Over the last decades, several psychophysical studies have reconsidered auditory perception processes on the basis of the two following assumptions : i) each narrowband signal resulting from cochlear filtering should be viewed as a sinusoidal carrier with superimposed amplitude modulation (AM, the “temporal envelope”) and frequency modulation (FM, the “temporal fine structure”), and ii) AM and FM cues are processed by partially distinct auditory mechanisms. By conducting listening tests with artificial or natural sounds (e.g., simple AM or FM sine tones or “vocoded” speech or music sounds), psychologists have found that the AM component (the envelope) is more important for sound identification (e.g., speech comprehension), whereas the FM component (the fine structure) is more important for pitch perception (e.g., melody recognition, speaker identification) and sound localization (space perception). However, additional psychophysical studies showed that the role played AM and FM cues depends on several factors such as language, or the presence of background noise or interfering sounds. 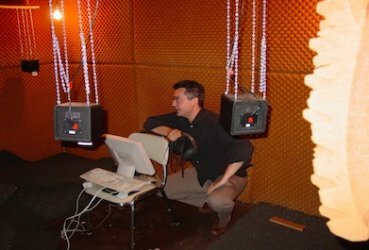 We will review empirical studies conducted by our laboratory, corroborating the notion that : i) our auditory ability to extract and use of AM and FM cues in acoustic signals is essential for the accurate identification of speech sounds in quiet and in noise, and ii) reduced ability to process AM and FM cues explains – at least, partially - auditory deficits typically associated with cochlear damage, and the limited benefits from current hearing aids and cochlear implants used to rehabilitate cochlear hearing loss. Shamma, S., & Lorenzi, C. (2013). On the balance of envelope and temporal fine structure in the encoding of speech in the early auditory system. Journal of the Acoustical Society of America, 133, 2818-2833.